Post nasal drip is a common and easily treatable side effect of an illness or infection, usually in the sinus. Let's dive into the natural post nasal drip remedies. Have you ever gotten out of bed in the morning and had a sore throat, runny nose and the feeling that something is stuck in your throat? No matter how much you cough or blow your nose the feeling remains? You probably suffer from post nasal drip. In this article, we will discuss what exactly post nasal drip is as well as the causes and symptoms of the uncomfortable disorder. We will guide you through various post nasal drip remedies to treat or even cure the affliction. We have glands in our mucous membranes known as mucosa that have a single function: produce mucus. Mucus is a saliva type liquid that is thick, a wet liquid that runs through our sinus, nose, throat, and airways. The purpose of the mucus is to clean out our sinus and airways from impurities that have accumulated through normal inhalation. When we get ill, have a sinus infection or other factor that affects the mucous membranes, the mucosa can go into overdrive. When this happens the glands produce too much mucus, and the result is a runny nose and constant swallowing to keep our airways clear. This condition is known as post nasal drip. It can be uncomfortable, irritating and embarrassing. Post nasal drip has a long list of causes and can range from things such as perfume and spicy food to allergies and infections. A side effect of some medication. The good news for those that suffer from post nasal drip is that even though it can seemingly be caused by random or spontaneous factors beyond our control, it is just as easily treated. Mucus formed in our sinuses, nose, and throat is hardly noticeable on a normal day to day basis. We unconsciously swallow the mucus throughout the day as it does its job cleansing our airways and nasal passages. However, when the mucosa overproduces the mucus, we will notice the excess build up as it drips from the back of our nose to our throat. There are several symptoms that can (and usually do) occur as a result of post nasal drip. When you suffer from post nasal drip, there are prescriptions and medications your doctor can prescribe. If you suffer severe post nasal drip, or if your throat has swollen or you have difficulty breathing you should seek immediate medical attention. Post nasal drips will cause sleepless nights and for that magnesium supplements are found to be a natural detoxifier and a great sleep aid. However, for those with a mild case that just doesn’t seem to go away, there isn’t a need to spend time and money going to see your doctor and waiting in line at the pharmacy when you can use natural home remedies for post nasal drip. With a few ingredients, you probably have at home already you can treat your post nasal drip naturally, and without having to subject yourself to doctor offices and visits. The most natural treatment is time. If you let the affliction run its course, the mucosa will resume normal mucus production on its own at some point in the future. However, if you haven’t been able to identify the source or main cause of the post nasal drip, this may take a lot longer then you would like. The following post nasal drip remedies are natural remedies you can try in the comfort of your own home. If the problem persists or worsens, you should always seek professional medical advice and visit your doctor. There could be an underlying problem that needs attention. ​​Perhaps one of the easiest and most effective treatments is salt water. The mucosa is overworked, and there is most likely inhaled irritants in the airways the gland is trying to clean. Salt water will aid in clearing out the passages while also making the mucus thinner and easier to expel from your body. Gargling salt water is a simple process, and you should repeat the treatment two to three times per day until the symptoms dissipate. All you need is warm (not boiling) water, ½ to 2/3 teaspoon of salt and glass. You do not need any special type of salt, such as Himalayan rock salt or sea salt. Simple table salt will work just fine. Dissolve the salt in the warm water by stirring it in a glass. Hold less than a mouthful and swish and gargle. DO not swallow the salt water, instead, spit it out into the sink or tub. Repeat until the glass is empty (usually about two or three gargles). Repeat this entire process two to three times daily. Does this sound weird to you? We don’t recommend following a locomotive around, however, if you have a kettle or a shower, you can add moisture to the air, and the hot steam from the water will loosen the mucus, thin the mucus and open the airways making relief quick and near effortless. The Shower Method: Turn on the shower and close off the bathroom. Make the water as hot as you can comfortably stand it. You want the water hot enough to create steam but not so hot it burns your skin. Sit in the bathroom and take deep breaths of the warm, steamy air. Likewise (and for more immediate relief) you can get in the shower. Breathe the warm, moist air and then allow the hot water to cover your face (do not try to breathe while you have your face in the water). Kettle Method: Boil water on the stove using a kettle, teapot, or other practical appliance designed for heating liquids. Once the water comes to a boil carefully and slowly pour into a large glass or Pyrex mixing bowl. Place the bowl on the table and sit in a chair in front of the bowl. Lean over and inhale deeply as the steam from the water rises. To aid in inhalation and prolong the water temperature, place a towel over your head and bowl to keep the air around your face warm and humid. 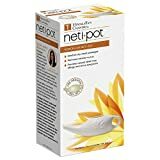 The use of a Netti pot is common for clearing out the sinus cavities of excess mucus and build up. Buy using nasal irrigation you will effectively decrease the amount of post-nasal drip until the mucosa resumes normal mucus production. To use a Netti pot, add salt, and baking powder to warm water. Tilt your head to one side and pour the mixture up your nostril. Moving your head back and forth will allow the solution to work its way through the sinus areas and the excess will pour from the other nostril. Repeat tilting your head the other way and pouring the mix into the other nostril. Once completed you will blow your nose until it is clear. Some foods are known to have decongestant properties. Sour and bitter foods especially work at making mucus thin and runny. By eating or biting certain foods, it is thought that the mucus will break up and be more easily expelled. Garlic: crush and sauté in butter then add to milk for a daily drink. Ginger: Drink a cup of warm ginger tea two or three times daily. Raw ginger can be sliced and bitten. Lemon: Add juice from a lemon to warm water and drink. You can also add lemon to tea. Cayenne pepper: Mix ½ teaspoon of honey and ½ teaspoon of cayenne pepper and ingest two or three times daily. There are several methods of reducing mucus generation and build up. You should alleviate symptoms by thinning the mucus, expelling the excess and reducing the cause of post nasal drip. Warm water or liquids will open up the airway and allow the mucus to be more easily expelled. Certain foods can also loosen and thin mucus. 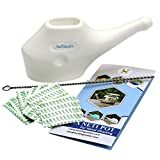 If that all fails, you can also force the airways and sinus cavities clear by using Netti pots. If the symptoms last longer than ten days, or you notice a foul odor to the mucus, find blood or experience shortness of breath and swelling of the throat, seek professional medical advice. We’re so happy to hear about that! Good for you, what other remedies would you recommend?